Proteins perform vital functions of life. They digest food and fight infections and cancer. They are in effect nano-machines, each one of them designed to do a specific function. But how did they evolve to fulfil those needs, how did the genes encode the structure and purpose of proteins? 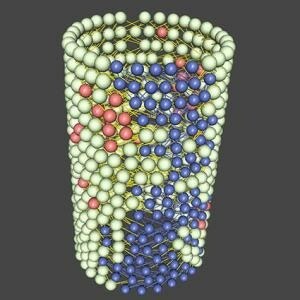 Scientists from the University of Geneva (UNIGE), Switzerland, the Institute for Basic Science, Korea and the Rockefeller University, U.S, have undertaken a study that aims to find answers to this question, and explain the basic geometry of the gene-to-protein code, by linking proteins to properties of amorphous physical matter. The entire article can be found in Physical Review X. A protein can be defined as a chain consisting of twenty different kinds of amino acids with intricate interactions, and, in contrast to standard physical matter, it is selected by evolution. The blueprint for protein synthesis is written in long DNA genes, but we show that only a small fraction of this huge information space is used to make the functional protein. Jean-Pierre Eckmann, Professor, Department of Theoretical Physics, The Faculty of Science of UNIGE. Along with Prof. Tsvi Tlusty from the Center for Soft and Living Matter, Institute for Basic Science (IBS) in Korea and Prof. Albert Libchaber from the Rockefeller University in New York, Prof. Eckmann reveals that the only alterations in the code that matter are those happening in the segment of the gene coding the mechanically pertinent hinges of the nano-machine. The alterations in other regions of this extremely redundant code have no impact. "We are now using this new approach to understand the relation between the function and dynamics of several important proteins."